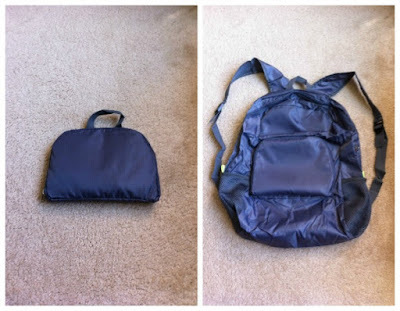 When I first received the Foldable Backpack by Alistart, I thought that there was no way that this foldable backpack could possibly unfold to full size or be sturdy enough to actually use. As Pop Shock Readers know, Mr. Hubs and I love to go hiking and camping and spend a lot of time outdoors as often as we can. Plus, we always love to explore whenever we travel to a new city. This is the absolute perfect solution for vacations or for those who like impromptu hikes. This backpack is one of those brilliant ideas that I wish I had thought of first. It literally is pocket sized and unfolds into a full size backpack. We’re going on vacation in a few months and I can’t wait to try this out! I did test it by filling it with all of the items that I would normally take on a hike or to walk around a new city. I was super happy to find that everything fit and that the backpack was sturdy. The Foldable Backpack by Alistart sells for $8.59 on Amazon, and since there is no doubt that Austin will want one, I’m off to buy a few more!